This paper examines the effects of introducing super-prefectures (Do-shu), from an economic and fiscal perspective. 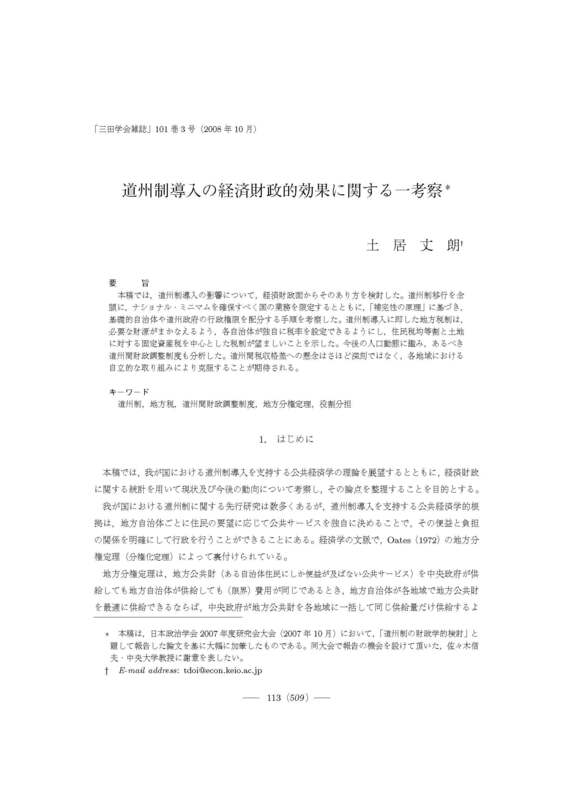 Acknowledging the transition to the super-prefecture system, in addition to limiting the activities of the national government (ensuring a national minimum) based on the "principle of subsidiarity", I investigate the procedures for the allocation of administrative authority between basic local and super-prefecture (wide-area local) governments. Moreover, I demonstrate that the local tax system conforming to the introduction of super-prefectures must allow for autonomous setting of tax rates by each local government to cover necessary financial resources and should adopt a tax system centered on a resident per capita tax and a real estate tax against land.